It was three years back that LG revealed their smartphone which will be made available to the folks over at Google, where that handset was the highly rated LG Nexus 4. Of course, Google has always partnered with different kinds of hardware manufacturers when it comes to rolling out stock Android flagship devices over the past few years, and this time around is no different as LG Electronics stepped up to the plate with their third collaborative effort, calling it the Nexus 5X. Just what does the Nexus 5X come packed with under the hood that would make it a serious high end player? For starters, there is Android 6.0 Marshmallow right out of the box, being Google’s newest operating system for mobile devices which will ensure that you need not have to wait for an operating system update for the longest time before it happens. The Nexus 5X will come with a sharp 5.2” 423ppi Full HD IPS display with advanced In-Cell Touch technology, delivering faster recognition, better outdoor visibility and crisper images. A Qualcomm Snapdragon 808 Processor will keep things humming underneath the hood, ensuring that Nexus 5X owners will be able to enjoy a smooth and effortless performance for any demanding task. Not only that, it will also feature a fast Type-C USB port, where a 10-minute charge is capable of having it obtain enough juice to keep on going for another quartet of hours. 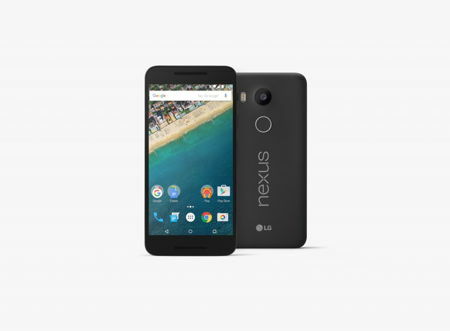 In terms of its imaging capabilities, the Nexus 5X will sport a 12.3MP rear camera and a 5MP camera in the front, where the 1.55µm sensor on the rear camera and 1.4µm above the display are capable of absorbing more light than any previous Nexus device, ensuring that you end up with brighter photos than ever before with stunning details even in less than ideal lighting conditions. The Nexus 5X is also well equipped to capture 4K and slow-motion videos. The conveniently located fingerprint sensor on the back is a joy to use, where a single touch of the sensor is all it takes to power on and unlock Nexus 5X for immediate use. 2GB RAM and either 16GB or 32GB of internal memory rounds off the list of specifications, and you can pick from Carbon, Quartz and Ice shades – although reportedly there is a Gold colored model available for purchase in Japan.